The contours of India-US relationship have witnessed a quantum change at least in the convergent strategic thinking that the two countries have managed to develop in the 21st century. While this partnership is something that enjoys support across the political spectrum in both the countries, the uncertainty attached to President Donald Trump’s administrative style has had policymakers in Delhi re-calculating their steps. Although Prime Minister Narendra Modi had spoken to President Trump over the phone, a face-to-face meeting was thus required to set a chemistry between the two leaders. It was required to put policy speculations to rest and assure that the relationship is in no particular danger of facing a policy paralysis. The recent visit led to a no frills engagement between the two leaders, unlike the extravaganza seen at the Madison Square Garden earlier. However, the public display of warmth that has become a signature style of Prime Minister Modi’s diplomacy was very much in play during this visit as well. Trump’s predecessors, President George W. Bush and President Barack Obama have set high standards to match in terms of India-U.S. engagement. That’s exactly why this visit was important and a reciprocal visit from the American president should soon take place to set the ball rolling, at a time when enough questions have been raised on Trump’s approach to H-1B visas as well as his decision to pull out of the Paris climate change accord. After having walked out of the Paris accord, Trump had lambasted India for making “its participation contingent on receiving billions and billions and billions of dollars in foreign aid from developed countries.” But, in the joint statement, he joined the Indian Prime Minister in affirming the importance to leverage “new opportunities to elevate cooperation to enhance global energy security.”Another instance of Trump’s infamous “flexibility” in the show. China was the elephant in the room, with both leaders expressing intent to maintaining peace and stability in the Indo-Pacific region. Although the joint statement reiterated the importance of respecting freedom of navigation, overflight, and commerce throughout the region, it was watered down from earlier references to the South China Sea. The joint statement remained short of mentioning China’s Belt and Road Initiative while calling out for transparency in regional connectivity infrastructure. It is unclear how exactly India is going to work together with the United States to counter North Korea’s weapons of mass destruction, as pledged in the joint statement. At most, this can be seen as a reflection of Trump’s own displeasure with China’s role in controlling North Korea’s belligerence. The Modi-Trump first meeting had a lot of succor for those looking towards the American president’s harder stance on Pakistan and terrorism. Hizb-ul-Mujahideen leader, Syed Salahuddin was declared as a Specially Designated Global Terrorist and both sides called on Pakistan to prevent its territory from being used to launch terrorist attacks on other countries and to expeditiously bring to justice those who had perpetrated terrorist attacks on the Indian soil. However, despite increasing convergences over the need for intelligence sharing to counter terror, and hardball rhetoric against Pakistan and naming certain individuals as global terrorists, doubts still seem to persist regarding America’s intention to put Pakistan’s feet on fire as far as acting against anti-India groups is concerned. Trump’s approach to Afghanistan is still evolving at a time when reports have emerged that the Obama-era Special Representative for Afghanistan and Pakistan would be dissolved. While there is overall support for India’s role in Afghanistan, there is the lack of clarity as to what would be America’s response if India was to step up its game in Afghanistan. This is the formative phase of Trump’s Afghanistan policy and hence, a good time for India to emphatically press its interests and priorities. One of the most important component of India-US partnership remains cooperation in the defense sector, both in the increasing interoperability exercises such as the flagship Malabar exercises and the developments in defense trade. India has emerged as a major defense partner for the United States. Recent deals to start an F-16 production plant in India and the procurement of unmanned maritime surveillance drones are steps forward. However, India’s desire for high-technology procurement from the United States and America’s focus on the payoffs of trade in defense materials needs to be constantly assessed to create a mutually beneficial environment. India-US maritime cooperation towards enhancing maritime domain awareness and thwarting unilateral aggressiveness in the Indo-Pacific region should be constantly communicated between the leaderships and stakeholder institutions in both the countries. The economic partnership between India and the United States remains an important area of concern with Washington showing the strong concern for the trade imbalance against the US. This mood was quite apparent with some leading US congressmen expressing strong concerns regarding India’s economic openness, in a letter to President Trump. The issue of intellectual property rights has remained a major irritant for long, especially in the pharmaceutical sector and New Delhi should stay prepared to deal with a Washington that might turn up with stricter versions of “fair and reciprocal” trade. Prime Minister’s invitation to Ivanka Trump to lead the American delegation to the Global Entrepreneurship Summit in India, might be a good move given the first daughter is assumed to have the President’s ears. When Donald Trump became the president, there was a general argument that Trump would change his unpredictable ways once he enters the White House and will mold himself to the system. However, it can be safely presumed by now that he is least interested in playing by the old rules and gives too much currency to the traditional foreign policy thinking hats in Washington. Modi’s first meeting with Trump has managed to open a gaffes-free new chapter in India-US relations, which is bound to have new challenges and prospects ahead. 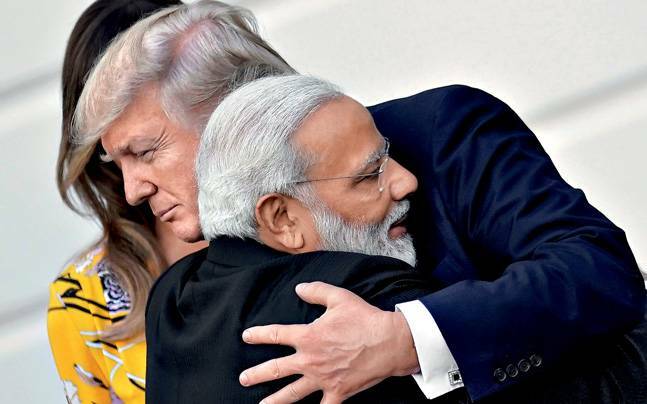 As a good ground was laid for Prime Minister Modi by his predecessors to take forward the India-US partnership, so has President Trump’s predecessors done for him. So, it will be wise for New Delhi and Washington, hereby, to take the road taken and move ahead towards making this relationship truly “consequential”. Monish Tourangbam (TR RID: L-2939-2016) is Assistant Professor at the Department of Geopolitics and International Relations, Manipal University (Karnataka), India.